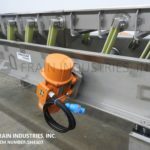 Commercial, Model Vibra Glide, stainless steel vibratory trough style feed conveyor with product volumes per minute or hour – depending on materials and application. Equipped with an 18" wide x 120" long trough with (2) 4" high internal baffles to help even distribution. Charge end of trough has 5½" deep side walls with a charge height of 55" and discharges with 36" ground clearance. Mounted on heavy duty stainless steel frame with (2) 0.36 HP vibratory motors. Key Technology Iso-Flo 208" long x 24" wide x 8" deep, dimpled stainless steel, vibratory conveyor. Equipped with 8" high guide rails, four 7-1/2" long x 6" high side clean out chutes, and a 32" high discharge, manual variable height diverter. Mounted on a stainless steel frame. Meyer, Model VibraFlex VF11-12-6, vibratory conveyor. Equipped with 12"W x 198"L stainless steel bed with 5½" high side walls, 8" diameter charge port, 8"diameter discharge chute, 21"discharge height, ¾ HP drive, control panel with on/off switch, stainless steel dust covers. Smalley, Model EMC2+, stainless steel vibratory feeder. Equipped with a 72"long x 48" wide x 25" deep stainless steel product hopper, 44" wide x 72" long stainless steel bed with 4" high side walls, 68" charge height, product flow control gate, 42" discharge height and a variable frequency MA520 vibratory shaker drive. Mounted on a painted base frame. Smalley, Model EMC2+, multi-lane stainless steel vibratory feed system with pounds of product per hour – depending on materials, application and machine configuration. Equipped with a 46¼" wide x 74" long bed with 4" high side walls, 50" wide feed throat with a 42" infeed height, (31) 1¼" wide product feed tracks, 12" long screening section with ¼" diameter holes, 6" diameter bottom discharge for seperated product with 12" ground clearance and a 32" vibratory bed discharge height. Control panel has touch pad and e-stop controls. Mounted on (4) leg base frame. 456"L x 16"W, S/S, vibratory pan conveyor. Has a 452"L x 16"W x 6"H pan split into two 452"L x 7"W x 6"H sections, 3hp drive, and a 48"H discharge. Mounted on a mild steel frame. 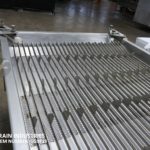 Triple/S, 24" wide x 264" long, Stainless steel vibratory conveyor. Equipped with 22’L x 34"W stainless steel cover with (2) 4"dia inlet ports, and (2) discharges (1) 10"L x 24"W and (1) 10"dia. Vibratory, sizing, separation and feed conveyor system. 228" L x 18" W x 6" D, single deck vibratory conveyor has a 79" L x 36" W x 24" H, S/S, split product feed hopper, and top 144" L x 17 1/2" W x 1 1/2" D, S/S, screw on, removable separation screen with 1" dia product sizing holes and left angled oversize product discharge chute. Remaining product drops down to main conveyor section that has a 8" L x 17" W separation section with 1/4" dia sizing holes and right angled undersize product discharge chute, final good product is discharged on left angled product chute at end of conveyor all with 41" floor clearence, 2 hp motor drive with saftey guarding and is mounted on a heavy duty painted base frame, can be used for uniform large / small / right on product separtation without scalping. 420"L x 7-1/2"W vibratory conveyor. 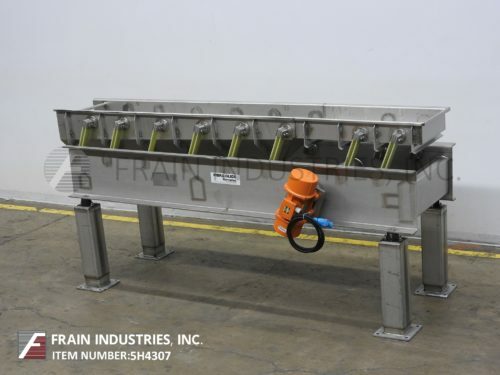 Equipped with a 72"L x 7-1/2"W sifting area with 3"H rails, 276"L x 7-1/2"W x 6"H sifted product conveyor which discharges at 40"H through a 7-1/2"W x 5"H discharge port with a 46"H infeed port.